Let us set the scene - the Lower East Side of Manhattan, in February, 1969. A little less than a year earlier, rock impresario Bill Graham had successfully established an East Coast annex for his San Francisco empire, when he took over the Village Theater, a magnificently seedy old movie palace (formerly the Loew's Commodore, and before that a home to Yiddish theater productions), and renamed the place Fillmore East. Graham clearly relished being back in the Big Apple, where he had grown up, and regularly flew in from California to keep an eye on his new baby, attending to every detail of the operation, presiding over two shows a night at the Fillmore, and then, in the wee small hours of the morning, repairing to Ratner's, the legendary dairy restaurant next door, to review the evening's events and think of ways to make things run even more smoothly (so dependable was this routine that Bill had Raterner's phone number included on his business cards, along with an indication of the hours he could be reached there). Graham knew that New Yorkers were a demanding audience, and he ran a tight ship. Into this milieu stepped the Grateful Dead, whose considerably more anarchic ethic sometimes put them at odds with Graham's way of doing things. If it seemed at times like this hard-nosed promoter and this tribe of psychedelic misfits came from entirely different planets, there was, nonetheless, a lot of mutual respect and affection in the relationship (as evidenced on these recordings by the band's presentation to Graham of the bronzed cowbell he had played in his debut as a guest percussionist with the Dead one wild San Francisco night - an artifact he treasured for the rest of his days. For the Grateful Dead, coming to New York, far from the cozy familial atmosphere of the San Francisco scene, always presented a special challenge. For the February '69 shows, the stakes were even higher, because the band had been invited to serve as opening act for one of the period's most intensely hyped events: the New York debut of Janis Joplin and her new band - her first high-profile appearance since leaving Big Brother and the Holding Company and beginning her quest for solo stardome. The media were out in force, from the denizens of the underground press to Mike Wallace and a crew from "60 Minutes". Given the Fillmore's two-shows-a-night policy, the Dead, never known for brevity, would have to cram a lot of music into a one-hour-per-show slot. And then there was the daunting task of playing for an audience primed to hear the wildly-anticipated solo premiere of one of the most incendiary live performers of all time. The band was, to put it bluntly , scared shitless. As it turned out, their fears were unfounded. As you can hear on these discs, the two sets that the Dead played on February 11 were little miracles of concision - compact, powerful performances that still managed to convey the open-ended abandon of the band's more customary marathon gigs. And they more than held their own in the face of the Joplin juggernaut - Janis was heard to say, with rueful admiration, that she should've opened for the Dead. And one can easily picture Bill Graham, in the pre-dawn hours of February 12, 1969, sitting as his usual table at Ratner's, replaying the Dead's performances in his head, and, at last, smiling. Fillmore East 2-11-69 was released in October 1997. 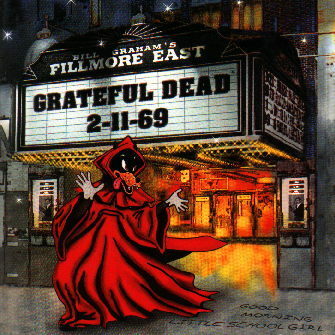 It is a complete release of both shows on 2/11/69 at the Fillmore East in New York, NY.